On the road! After three days at the ISE show, we had Monday to change out the fluids and pack the truck. Of course I was my typical optimistic self about fitting everything in the truck and trailer. Well, we did fit everything, but could not have added one loaf of bread in the space left over. Chris said goodbye to Sharon and we rolled the heavy beast to downtown Prescott for some video. On the way out of town I stopped into Stephanie’s office for a quick kiss and we started putting on the miles. The first thing that amazed Chris and I was how well the truck was running on the highway, despite weighing over 7,700 lbs. GCWR. The smooth riding AT’s and the 5.29 gears was the right combination and we managed nearly 600 miles before stopping south of Nephi. We had the Eezi-Awns deployed in a few minutes and I fell asleep with the sound of I-15 rumbling in the background. Earlier today, Paul May of Equipt Expedition Outfitters treated us to a fine lunch in Salt Lake City, UT at the Red Rock Brewing Company. Mmmmm… smoked trout club sandwich. I was wearing a t-shirt and light pants… 500 miles and three states ago. Now it’s a different story. We stopped earlier to pack our night bags with everything we need to move from the truck to the tent rather quickly. Fabulous scenery today coming into Jackson. Lots of snow finally. Ok, that’s it… I am off to bed. So Chris and I had this idea of eating healthy along the trip, and even made a trip to Trader Joe’s to stock up on a myriad of natural meals and snacks, ranging from Dragon Fruit to Smoked Trout in a can. Mmmmm. Well, it sounded like a great idea at the time, but we are failing miserably. Our hopeless tumble into culinary chaos started subtle enough with a Salmon Club in Salt Lake, but ended most masterfully in Jackson, Wyoming at the Gun Barrel Steak and Game House. Those of you who know me are aware of my addiction to protein, a part of my genealogy that has defied evolution. So when I caught a glimpse of the sign reading STEAK and GAME, I nearly pitched the truck and trailer into a skid trying to make the driveway. Scott in a protein-induced coma. We were up before dawn this morning and on the road within a half hour in hopes of getting some good photos and video with the morning light along the Snake River. We drove 445 miles today, getting to Missoula well before dark despite all of the stops along the way to capture images. We traveled a beautiful route (thanks K.C.) that kept us off of the main interstate and on the country byways along the west side of the Tetons, West Yellowstone and the Madison range. The weather was really nice today. Not much need to bundle up and it was quite sunny at times. Animals seen (not including stuffed and mounted…LOL): Herons, Magpies, Hawks, Antelope, Llamas, Cows. Dave Harriton of American Expedition Vehicles (AEV) took us to a place called “The Old Post” for a nice dinner. Thank you Dave! View of the Tetons from Idaho. We spent the day with Dave and Kent of American Expedition Vehicles (AEV) driving and reviewing their incredible trucks. AEV operates a research and development facility in Missoula, MT, where they build custom Jeep expedition vehicles and concepts for SEMA and other shows. Dave, the CEO is also an expedition and adventure traveler and has built a custom Jeep Wrangler, Brute and Commander for an overland and kayaking trek across Iceland. Their fabrication and attention to detail can only be described as exceptional, with the goal of OEM fitment and quality along with significant increases in trail performance. Their Brute has been a favorite of mine since the beginning. In addition to the time spent in their R&D facility, we had the chance to get out on the trail and see the vehicles in action. With 40″ Irok tires, the Commander was nearly unstoppable and also ran down the highway at 80 mph. Special thanks to Dave and his team for the hospitality and time spent despite their deadlines for Easter Jeep Safari. Northern Montana is breathtaking, with massive granite peaks standing above a thick forest of Pine and Aspen. The Flathead river is equally impressive, with its volume reaching over 20,000 FPS. We crossed the border into Canada at 1:30 pm, and after a few questions by the gate guard, we aroused enough suspicion to require a trip upstairs and a talk with the immigration officer. Another set of questions and the officers left eyelid began to twitch. Where are you from? How long did you live here or there? How long have you known each other? Professions? etc. Off he went into his office for another 10 minutes before calling us each into the room individually for more questioning. Have you been arrested? Detained? Ever in court? Fingerprinted? All perfectly appropriate questions in hindsight given the horse we rode in on. After the crossing we had a two hour drive to Calgary, where we met up with Pete (MountainPete on expeditionportal.com) for a dinner and a few Guiness for St. Patrick’s Day. We are making an early camp to be well rested for a day of ice climbing tomorrow. We had a great day in the Calgary area with the morning spent ice climbing in Canmore with Yamnuska Mountain Guides where our guide Sarah worked hard to keep the climbing interesting and accommodate the video crew and questionable skills of the climbers. Chris and I climbed three different routes in the mountains outside of Canmore. Just like rock climbing, as soon as you begin to trust the crampon points it all starts to work. Thanks again to Sarah and Yamnuska for the great day. After climbing we dropped down the hill back to Calgary and an evening with Steve and his family, who were gracious in providing a warm and quite place to sleep in their home. We also met up with a group of Canadian fourwheelers from the Rocky Mountain Cruiser club. An awesome group of guys with very cool trucks. We met at the Keg for dinner and spent hours talking about great Toyotas and the travels of the groups members. A first class club! Today we pushed out of Calgary to begin a few long days where we will be putting on a lot of miles to get us up to Inuvik on schedule. The temperature has dropped considerably since our arrival on Saturday when we enjoyed a dinner outside on a patio with Pete. The wind is biting with the air temperature at around 19-20F. Still warm compared to what we expect ahead. The roads have changed personality with swirling powder drifting across them and snow banks along the sides. With a late morning start, we managed to put on 510 miles periodically driving through light flurries and sometimes considerably heavier accumulations. We stopped to camp just west of Grand Prairie. This puts us about 70 miles shy of Dawson Creek. We are seeing a lot of signs for moose, but I have yet to see any. Everything is working well. The Sirius radio is running at two or three bars of signal strength. We still have phone and internet signal. We’re still sleeping in the Eezi-Awn tents.The BFG tires are gripping well. We’re expecting the temperature to drop down to about 14F tonight. I’m really enjoying the changing conditions so far! Shortly after our last blog post we lost contact with the outside world via phone and internet. After Fort Nelson, where the junction with the road to Yellowknife is located, the Alcan road changed quite a bit. Covered in packed snow and with much less traffic it began to wind and climb up into snow covered mountains. The topography became much more rugged. Our pace was slowed considerably. Scott would use the trailer brake engagement switch to test the road surface. If the traction was good, we could feel the trailer stopping the truck. If the road was slick, there would be no resistance from the trailer. We chugged along until around 11PM when the resident of a closed campground allowed us to pitch the tents in front of his house. We saw the coldest reading yet registered on the Cyberdyne air temperature gauge at -3.0F. The Eezi-Awn tents are still working well. We have been laying the covers on the ground semi-flat instead of folding them up because the PVC is much stiffer at these temperatures. We both experienced cold feet in the sleeping bags over night. My sub-$50 Alps bag was definitely a much appreciated piece of gear last night, but I think it has a bit too much interior volume that allows too many voids between myself and the bag. Combined with the lack of a draft collar, it isn’t impervious to cold air getting inside. The result is that while most of my body was kept sufficiently warm, there are cold spots. Draping my down parka over the hood area helps. And this is far from the -20 rating. We made it to Whitehorse, Yukon Territory today and have a hotel room for tonight, but we’ll be camping again tomorrow night much further north. I’ll let you all know how it goes. By the way, we saw some bison this morning! Despite the lack of clouds, the sky has almost no color, a muted shade of lavender punctuated by the near stick-like Spruce, coated in frost, stunted and packed tightly together. It is so dry that my eyes itch and my nose stings when taking a long breath. We heard word of the highway being closed at Eagle Plains due to high wind and whiteout conditions which has us slightly concerned, but we continue north regardless, hoping to be staged should the road open. Just after turning on to the Dempster yesterday we looked for a place to camp and prepared a hot meal. At about 30 km a small track turned uphill into the trees and had no signs limiting entry. The snow was deep but our faithful Tacoma pulled through and up to a level spot. A good night’s rest was welcome. On up to Inuvik tomorrow. Scott’s last blog indicated that we would make it to Inuvik today, but we just kept driving yesterday and arrived last night. I am sending this blog from a (toasty warm) little cabin that we are staying in. It’s great to sit in here and sip on some hot chai while looking out at the chilly snow. It was -17F out there when we woke up this morning. The low tonight is supposed to be -28F. Due to poor light and visibility today, we decided to lay low and wait for better light tomorrow before getting out to shoot photography and video with the sled dogs. It’s great to have some down time after 10 days of driving. The trip between Whitehorse and here has been a really rich experience for us. Some of the driving was pretty intense, but we’ll save that story for the video and article. Camping in the winter along an old logging road off of the Dempster highway was perfect. Cold, crisp, and beautiful enough to keep us in awe. I know a lot of you wanted to know about the gear, so here is a little update. I ended up using my Moonstone 0-degree down bag, and sleeving the Alps budget bag over it. So I guess I was right about the Alps bag when I commented it was a bit too voluminous for me, as my down mummy fit inside perfectly. I stayed plenty warm all night and without cold feet. I slept with my Outdoor Research “Gorilla” balaclava on my head, and it’s pretty deluxe, keeping the frigid air from my face. I have been using the wool mitts that convert to fingerless gloves a lot. These in combination with Thermasilk glove liners allow enough dexterity for the cameras and electronics. We use two stoves in the tent simultaneously. A Jetboil to make hot water for chai, and Scott’s trusty old Markell fuel canister stove for heating up dinner. Last time it was lentil rice Biryani with Punjab Choley (Indian food). As far as electronics, the various cameras are still working well, and we have been using my Magellan handheld GPSR for recording and saving each days GPS data and tracks. We are using the little GoPass GPT-800 Bluetooth GPSR with DeLorme Street Atlas 2007 Plus on the laptop for navigation. The software is pretty useful, but has a few quirks. The Eezi-Awn tents continue to provide shelter for us and a comfortable place to crash out even if it is colder than a meat locker when we first climb in… LOL. The Sirius radio finally began struggling with the signal right around the start of the Dempster highway. Not bad! It hung in there providing us with tunes for a really long time. Animals seen: Lynx, Fox, Wolves, Coyote, Caribou, Moose, Bison, Willow Ptarmigan, Ravens. Seeing the wolves was absolutely amazing! They had just eaten some caribou. Well, the disturbed duo you have read about to this point really has a third member in its ranks. We wanted to wait until we had a little more to share though, before breaking the news. So Expeditions West has brought along Pasquale Benedetto, Director of our Overland Video division for the expedition. Pasquale is capturing the adventure in full 1920 x 1080 High Definition video recorded with a XL-H1 with a 5.4-108L lens and an XH-A1. The XL is covered in either a fully waterproof Porta-Brace cover or insulated (with warming packets) Porta-Brace jacket. We are very excited to have him along, despite the more cozy interior. Thank goodness for the Adventure Trailer! Click the video capture below for the Dempster Highway Trailer! Mush! Well… at least that is what we thought we were supposed to yell. But it turns out that “mush” isn’t really the thing to shout and “go doggies!” works just fine. Give a light press on the braking pad and say “Chee” to turn right and “Chaa” to turn left. These are all things we learned today when we experienced what I would consider overlanding arctic style. Judi Falsnes of Arctic Chalet has some very fine dog sledding teams and they hauled us around this arctic wonderland for the ride of our lives. I can easily see how this could become addictive! I can imagine myself loading up the sled with gear and hitting the trail for a long term adventure with the dogs. We were lucky enough to sled with a cross-breed of Alaskan malamute and Siberian husky. They are pure white and I would consider them to be the “Land Cruiser” of sled dogs. They aren’t the fastest, but they will just keep running forever. These are endurance dogs. When they have made it through the turns and over the hills and you stop for a break and praise them individually, you can really see the satisfaction in their eyes. Very inspiring! I don’t know if I was more impressed with the dogs or Pasquale. He had his own sled team and filmed the entire trip holding a heavy HDV camera and getting all of the shots. If you have ever tried to hold a large camera and keep it steady while filming you will know why I am impressed. The cold creeps in quickly on the frozen sea, with no land to break the wind’s path, not a tree within a dozen miles for shelter. It is -23 and the sun is setting against the expanse of frozen ocean beyond our view, the crumpled surface reflecting the suns auburn hue across fissures of ice cracked from the pressures of the ebbing sea. Despite our discomforts, we are humbled by the fact that Joe, our Inuit guide maintains a hunting Igloo, 30 miles further into the Arctic Ocean, where he insulates himself with twin Caribou hides laid skin to skin and covered with a 4x down blanket. We spent the day in Tuktoyaktuk with Joe and his family, sharing in their stories, myths and a meal, the silence broken by their son Larsen playing “Folsolm Prison Blues” with his hair greased back and a white buttoned down shirt . However cold this place may be, we were warmed by the hospitality of our new friends, who welcomed us into their home and a brief view into their lives. In all of my travels, whether a Tarahumaran family in Barranca Del Cobre or a Bedouin tent in the Sahara, the distant enclaves of aboriginal people are nearly always the most giving and content. The day seemed to last forever yet it was over in an instant, the suns final rays slipping across the horizon. There is no way I can possibly describe everything that has happened since we left Tuktoyaktuk here in this tiny square of .html space reserved for my blog. I have been humbled and awed by what I have seen and experienced. Some of the highlights: We successfully navigated a very remote route between the Mackenzie ice road and the town of Ft. MacPherson. Along this route, we stopped at a great little place called Aklavik. That was the last outpost we would see before Ft. Macpherson 120 miles later with only the Peel River to guide us. We encountered no one along the way. We watched caribou battling in the snow. That evening, I saw the Northern Lights for the very first time. We ended up camping along the Dempster about half way between Eagle Plains and mile 0. The temperature dipped very low, at least -23F which is where our digital gauge seems to bottom out. It was likely -30F based on numbers from other people. We are in Whitehorse this morning and are headed out for the Cassiar highway. We have a long way to go on our journey south. Thanks to all of our family and friends for the well-wishes. We’ll be careful. 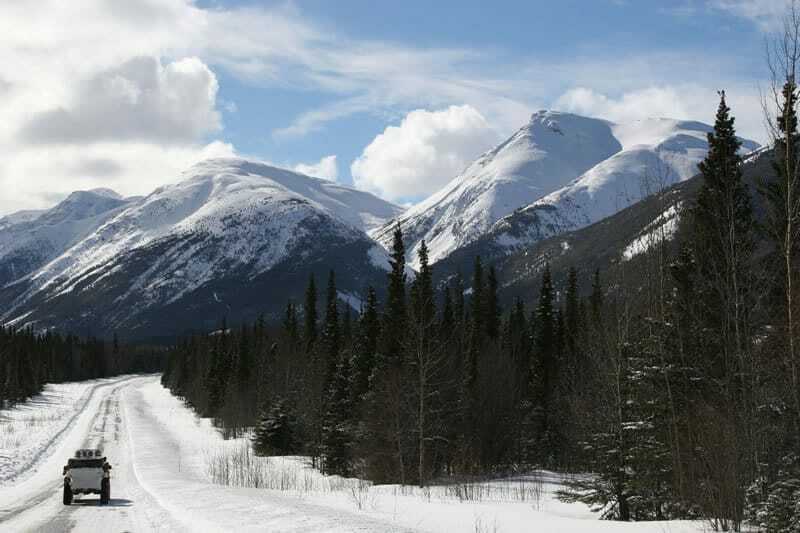 Yet another famous road in western Canada is the Cassiar highway. We had made a long drive from Whitehorse, backtracking over our original route almost to Watson Lake, to finally arrive at the northern terminus of this storied byway. Keeping with my mantra for the trip, “no expectations”, I was open to any and all possibilities as to what the road may hold in store for us. We stopped at a small fuel station located at the junction of the Alcan and Cassiar to fill up the tanks. The attendant warned us that we may want to avoid the route due to a storm in the area, and mentioned that the challenge of keeping the road plowed often results in a hardly adequate width to be considered two lanes. The Cassiar led us through spectacular mountains laden so heavily with snow that I wasn’t sure to rejoice for the warmer temperatures or loathe them. We passed several avalanche warning signs all the while “oooh-ing” and “aaahhh-ing” at the lofty peaks and alpine lakes blanketed in snow. Day turned to night and on-coming traffic became nearly non-existent. We arrived at the gate for the closure area, but it was open. Soon the plowed banks of snow on either side of the road were towering over the truck, and there wasn’t much more than a single lane of road twisting through the middle. Pasquale was soldiering the truck through the turns with a vigilant eye and the HID’s burning holes into the blackness. I felt like we were gliding along a chute on a bobsled. With no way to get off of the road, we had to rotate driving shifts and complete the full length of the highway. We finally found a motel in New Hazelton and crawled into the soft beds at 3:00 a.m.
All three of us have managed to get sick, to one degree or another. Pasquale is hacking in the back and I have almost completely lost my voice and have a head cold. Chris is doing the best out of the group with a mild cold and failing voice. Despite our ailments we are still having an awesome time. Yesterday afternoon we met up with the Northwest Overland Society in a remote mountain camp near Index, WA. Peter, Craig, Britt and Todd. They all had sweet Land Rovers, though I was drooling most heavily over Todd’s Classic Range Rover with Maxi-Drive Axles, Air Lockers and the ultra-rare Brownchurch Roof Tent. A classy dude with an equally impressive machine. It was also great to meet Craig in person. Craig is a GIS guru that is working on some very exciting new vehicle-dependent navigation solutions (more info as soon as he has the beta version available). We made camp in what seemed to be more jungle than forest, with huge ferns and moss covering everything and rich undergrowth. The dense greenery was only interrupted by the trail we drove in on and the numerous creeks flowing edge to edge from the melting snow. Around the campfire we chatted about .GPX files, rack awning design, Pete’s philanthropic effort, etc. We woke the next morning to three inches of snow on the Eezi-Awns. Despite our best attempts, we can’t escape the white stuff. Seth, a good friend of mine from ARB drove up to the camp in his killer KJ, just finished a few weeks prior with Nth Degree Suspension and paint matched HD bumpers (among dozens of other cool mods). The group checked out the Jeep for a few minutes and then we moved on to the Lake Isabelle trail. Being used to desert driving, this trail was really fun. There were snow covered rocks, deep river crossings with more rocks and then huge rock shelves and fins to negotiate. The trail was tight, even for our Tacoma. The Discovery seemed to be the perfect dimensions. Overall we had a great time on this 2.5 rated track and enjoyed meeting the NWOS guys and checking out their cool Rovers. We are off to Bend, Oregon tonight and then to Moab tomorrow! Getting closer to home and our families. Adventure Driving: 700+ mile days on ice covered, two lane highways? My fascination with the concept of “adventure driving” came a few years ago while reading Tim Cahill’s book Road Fever, which in addition to being one of the more entertaining endurance driving reads, also contains some very practical driving considerations. 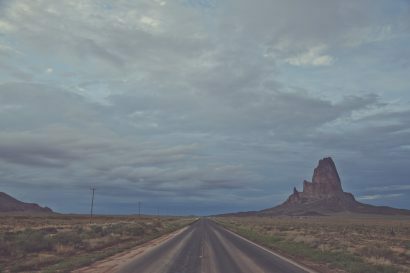 Road Fever is about Gary Sowerby and his 24 day record breaking drive from Tierra Del Fuego to Prudhoe Bay (Gary has made three other record breaking drives). Endurance driving is not about driving as many miles in a day as possible, but maximizing the number of productive driving hours a team can safely pilot and navigate. Setting a mileage goal leads to accidents, as drivers feel obligated to achieve a specific geographic point. In the case of sustainable adventure driving it is about maintaining the best conditions for the driving team. So, in addition to a few things I have gleaned from (the very limited) documentation from Gary’s trips, I have assembled a few from my own experiences. Having driven for 42 hours straight in the Western Sahara, I have seen the affects of pushing past these important limits. 1. You must trust the other driver’s capabilities: Drivers with limited experience should be coached before leaving on the trip and they should play a limited role in technical driving. Drivers that are easily distracted or drift in and out of the lanes increase the stress level of the other drivers in the vehicle and do not allow them to rest fully, leading to a sleep deficit. 2. Drive with purpose: Focus on the fundamentals of good driving and avoid distractions. Limit time on the phone or fiddling with music players. Drive alert, scanning the mirrors for threats. 3. Switch often: Never drive for a set distance (i.e., 300 miles each). Drive while you are feeling engaged and alert. At the first sign of fatigue, switch drivers. Even if a driver has only driven for 30 minutes. If all drivers are tired, stop and rest. 4. The driver rules: The other occupants of the car help to keep the driver alert, hydrated and with light snacks (crunchy snacks work great). There should always be either a navigator providing direction assistance, or a device the driver is familiar with. 5. 60% rule: Adventure driving is not a race, so all drivers must drive well within their capabilities, which will even vary by terrain type. Less experienced drivers should never try to drive at the same speeds as the better trained/experienced drivers. Just keep it at 60%. 6. Limit risk and exposure: Plan the day’s route out to prevent fuel shortage issues, or driving too far for rest or services at night. Limit night driving and slow down on poor road surfaces or where animals are present. 7. Protect the equipment: Your vehicle is your lifeline. Always be vigilant of security issues, inspect the vehicle daily and after every stop. Do detailed inspections (fluids, tires, suspension, etc.) at each fuel stop. 8. Quality of rest: Watch for signs of sleep deprivation, and ensure that you have a dry, quiet and comfortable place to sleep (if possible). Our Eezi-Awns were a welcome retreat at the end of a long driving day. 9. Diet and hydration: Drink lots of water and limit sodas and heavily sugared/ caffeinated drinks. Eating on the road can be a challenge too, but I have learned that fast food just does not work, so spend a little more and have one quality meal per day at a good restaurant. Eat high quality snacks (dried fruits, real jerky, nuts, etc.) for other meals. We did not have one meal at a fast food place during the entire trip, and it made a big difference. 10. Jolt? : Energy drinks are a slippery slope and should be used in strict moderation. They are loaded with sugar and caffeine which can lead to a dip in blood sugar. Stick with your usual routine. If you have coffee in the morning, keep doing that. On this trip, our team was lucky to have three strong drivers and we stuck to the above principles, which allowed us to travel over 9,000 miles of winter driving without incident. Off to Moab and the Easter Jeep Safari Tomorrow! It seemed like a fitting place to end our Arctic expedition, in the deserts of Utah. The Easter Jeep Safari is an annual gathering of off-highway enthusiasts, mostly with Jeep vehicles, though it seems that nearly all of the vehicles on trailers did not resemble anything in particular. EJS is also a great place to see new Jeep vehicles, meet vendors and check-out the latest innovations in trail equipment. 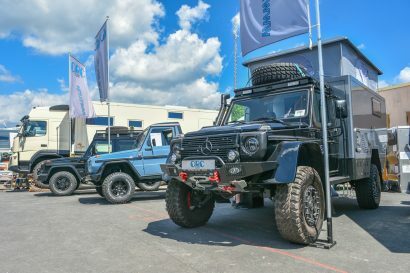 We spent some time checking out the completed AEV trucks, which was an amazing feat given the two weeks they had to finish them. The AEV Brute must be in my top three for coolest rigs of all time. We also spent some time with the folks from ARB and picked up their 05 Tacoma for some testing and trail use. It is a fun machine to drive and we look forward to using it on the trail. The new EarthRoamer XV-JP was also on display in the Jeep booth. It is has been so much fun to watch this project progress from concept to prototype. 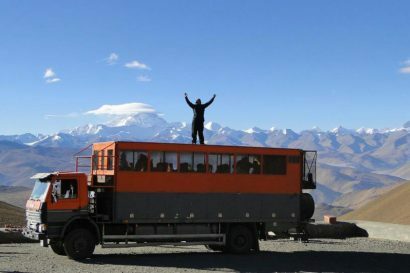 With companies like EarthRoamer, the future of overlanding in the US is bright! One more night of camping, somewhere near Bluff, UT. 1. Columbia gear – The Titanium Interchange jacket is an impressive piece of equipment. We took advantage of the versatility of the removable insulative liner many times. The liner works nice as a light stand alone jacket, and the shell was very appreciated when the arctic wind was blowing or when the Washington rain was trying to get us wet. My Columbia insulated/waterproof pants worked excellent to keep me warm and dry in sub-zero temps when used with fleece pants and a baselayer. I also used the Columbia fleece zip jacket for a majority of the trip as an easily donned or shed layer for managing body heat. 2. Minus33 100% wool underwear – Yea, I know, wool underwear sounds scary. But this company has somehow figured out how to make 100% merino wool soft as bunny fur. Very comfortable and very warm. It never got stinky. Well worth the cost. 4. Outdoor Research “Gorilla” balaclava – Yes it may look a little goofy, but what balaclava doesn’t? The advantages to this one are the durable construction, the ability to peel away the lower half of the mask for adjustment, or eating, or talking, and the gore windstopper material. I slept with this on in sub-zero temps, which kept the frigid air from my throat and lungs by allowing the heat of my breath to keep the passage between the outside air and my mouth and nose warmer. I also used it while dog sledding to keep the skin on my face from freezing and again, to pre-warm the air going into my lungs. 5. Leatherman E303 knife – Extremely handy, one handed operation (even while gloved), not too bulky, durable skeletonized glass-filled nylon handle is safe to use with bare fingers in sub-zero temps. 6. Canon cameras & lenses – every single one of our Canons, from my little Powershot A85 all the way up to the XLH1 HD video unit, performed exceptionally well. 1. HID IPF’s: One of the standout modifications of the adventure. Without question it improved our safety and reduced driver fatigue. 2. Columbia Clothing: Flawless and really heavy duty. The Titanium line is ready for real expedition work, not just a stroll at the winter film festival. We paid for every item and it all exceeded our expectations. 3. Canon Cameras: I fully expected a camera failure due to the extreme cold. We abused the Canon bodies and L lenses without mercy and had zero failures. 4. Synthetic Fluids: We used Mobil 1 fluids throughout the drivetrain. One night, along the Dempster we camped in -40 conditions, without being able to plug the truck in to keep the engine oil warm. After six hours, we cold started the truck without issue, or valvetrain noise and the oil pressure built quickly. 5. Adventure Trailer: We could not have done a solo vehicle trek with three guys and all the gear without the Chaser. I was skeptical of trailers for longer trips in the past; now I am a believer. Trailer brakes are a must too, along with a good suspension. The Chaser has both. 6. Eezi-Awn Tents: I expected the tents to stop working or fail (vinyl material or hardware failure) in the extreme cold. We had no failures and slept in them all the way down to at least -30. The mountaineering tent never left the bag. Oh, and the Sirius radio kept working all the way to N64 08, nearly 800 miles further north than their coverage area indicates. The end of the trip has come and gone. After being away for so long and finally arriving home, I neglected to catch up on the blog and go through the latest photos, but rather chose to get a good night’s sleep, and get back on the road. Home for only 24 hours, I don’t think I even checked my email before I was headed south to yet another campsite, but this time in the Sonoran Desert. It felt so good to be back in Arizona and sleeping under the stars with my skin exposed to the sky rather than hidden from it. Don’t get me wrong, I cherished my time in the arctic environment, but each part of the world has its own magic, and the Sonoran Desert is no exception. The palo verde trees have begun to celebrate the spring with a riotous display of blinding yellow. The gila woodpeckers are on a drunken spree through the air. And I feel extremely fortunate to be able to experience this arid landscape as well as the polar region of the Beaufort Sea, all within the span of a month’s time. I am very thankful to have met those people along the way that took time from their busy lives to say HI and share their thoughts, dreams and local knowledge with us. The natural world allowed me to see it in so many special ways on this trip, and for that I feel a deep sense of gratitude. Perhaps more than anything else though, this trip was an opportunity to reinforce and deepen my friendship with Scott and Pasquale, whom I have so much respect for. Even though we have all traveled extensively together, this was the first time the three of us shared a single and solitary vehicle. This trip just confirms that these are tough and easy-going guys, and now I know I wouldn’t hesitate to trust them on any expedition anywhere on the globe. Nice work guys. A big thanks to our sponsors for their support of this expedition. I absolutely enjoyed being a part of the testing and evaluation of your products in this extreme environment. Beautiful scenery, but the people are what make the adventure memorable. The more I travel, the more I have concluded that the people are what make overlanding such an awesome endeavor, at least for me. We traveled to the Arctic Ocean, but I did it with my best friends and met some of the most incredible people along the way. Everyone we encountered was supportive, helpful and friendly. From the oil rig truckers we spent an hour with while stopped on the Alcan, to Jim in Whitehorse who stopped working for a few hours to help us fix the trailer shock and wiring we had damaged. He even found a shop for us to work in out of the cold. First class people! 1. Without question, the nicest people in any country I have traveled in. They are helpful, relaxed and not pretentious. So a heart felt thank you to every person who helped us along the way and to the great sponsors that allowed this trip to happen. And thanks to Chris and Pasquale for being such incredible travel partners and friends. It is almost scary how well we get along and our personalities/skills compliment each other. We are ready for the next adventure, it just needs to be some place warmer and include Stephanie, Sharon and Kristina!